Professionalism counts in every industry you go. So while choosing the professional accurate transcription company, you need to see whether they have the below-mentioned qualities or not. Every transcription services that you see online or offline doesn’t have the required level of professionalism and that is why they are not even able to deliver the accurate transcripts of the media content you assign them. 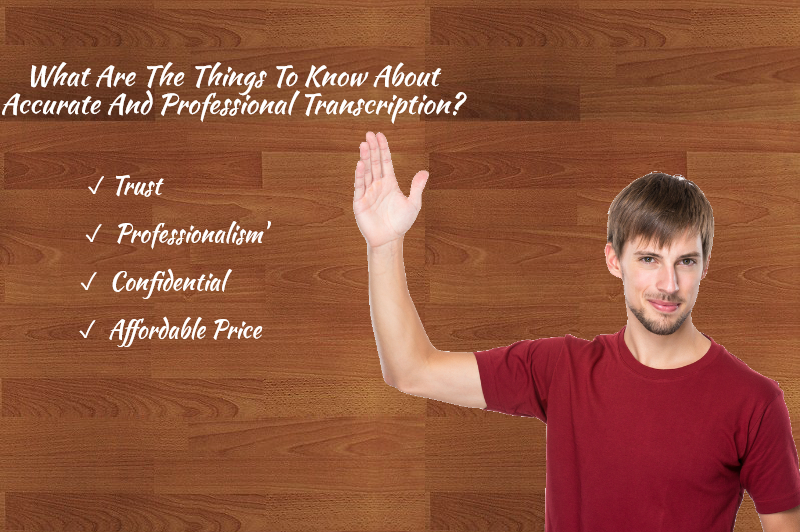 So what exactly is an accurate and professional transcription? Or what they do differently to be professional? While searching for the professional accurate transcription for work, you need to see whether they understand professionalism or not. In this industry, accuracy and professionalism count a lot beside time management. Time management also falls under the boundary of professionalism. What is professionalism without punctuality isn’t it? An professional accurate transcription service can be referred as transcription services provided within the deadline. The transcripts are error free and accurate and have clarity. Without clarity, transcripts are worthless. People reading them cannot understand what exactly the meaning is, so no point is wasting your money on such transcription service who provide such unclear transcripts which are not understandable. You should always hire the right transcription service provider and there are many if you seek at the right place. You can compare their services and prices online and offline too. What are the reasonable accurate transcription rates? While hiring the transcription companies for the first few times, you must not be that aware of the accurate transcription rates. You must consider comparing the prices for the transcription services on the internet to get a clear idea. Accurate transcription rates depend on the length of the content of the media file or event. You can check the prices for individual services and also the different packages they provide. Previous Post:Why Fast Accurate Transcription So Important? Next Post:How to Hire The Right Chinese Transcription Services?